Bookmarks keep you from having to reread the same pages over and over again in order to find your spot. These bookmarks do more than that. They're a beautiful, colorful way to remind you to indulge in art and thought more often. All are gorgeous, full-color illustrations, and most have a repeating pattern, such as a watercolor splash, geometric designs, and swirling mandalas. 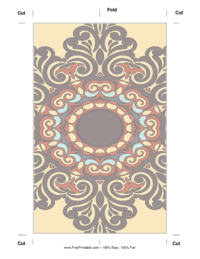 It's easy to print and make this bookmark into something durable and long-lasting. Lines indicate where to cut and fold the template, and then you can tape the sides together and laminate it. It also works well when printed on cardstock.